(Updated at 10:35 a.m.) After months of breathless speculation, Amazon has made it official and announced that it is coming to Arlington — but the county isn’t alone in winning the tech giant’s second headquarters. The tech giant announced today (Tuesday) that it will split its $5 billion investment for an “HQ2” between Crystal City and Long Island City in Queens, confirming earlier reporting of the last-minute switch. Nashville will also receive 5,000 jobs as part of the arrangement. A press conference has been scheduled for 1:30 p.m. in Pentagon City. Amazon will now set up roughly half of the new headquarters on a site in Crystal City a bid championed by state and county officials, as well as JBG Smith, the region’s biggest real estate owner. JBG Smith owns huge swaths of property throughout the neighborhood, which was long thought to be a key factor in Arlington’s favor. The company has launched a new website in conjunction with the announcement: Nationallanding.com. Crystal City’s high office vacancy rate, long a thorn in the side of county leaders that will now be alleviated virtually overnight, also provided plenty of open space for the company to work with as it plans a new campus. While communities across the country were vying to earn HQ2 as part of an unusual public bidding process, the D.C. region was widely viewed as a favorite to earn Amazon’s new headquarters after the company listed Northern Virginia, Maryland and D.C. among its 20 finalists in January. Even still, the company announced late in the process that it would seek to split HQ2, noting that executives didn’t believe that any of the finalists had enough “tech talent” to fill the contemplated 50,000 jobs for the new offices. 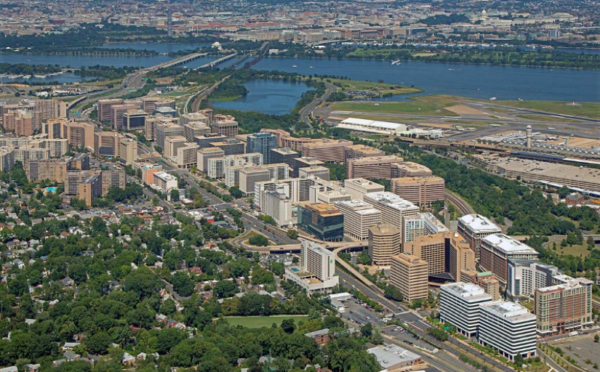 Arlington was long viewed as a particularly strong contender after the county submitted both the Crystal City site and locations along the Rosslyn-Ballston corridor for consideration. Amazon officials subsequently toured those locations this spring, and even linked many of its employees to a particular ARLnow article about the county’s environmental accolades. With the decision finally made, Arlington officials will now have to grapple with the impact of the company’s arrival — especially now that the company won’t be bringing quite the same investment as it originally promised. The rosiest estimates of HQ2’s impact suggest the company will create a “prosperity bomb” in the region, offering tens of thousands of high-paying jobs and filling up the coffers of local governments. But many critics have spent months warning that HQ2’s arrival could exacerbate many of the problems already plaguing Arlington. They reason the arrival of so many wealthy Amazon workers could cause housing prices to skyrocket and make it virtually impossible for low-income people to afford to live in the area, or even strain the region’s already challenged transit systems. Others still worry that the county has offered a series of lucrative tax breaks and cash incentives to the company, dampening whatever economic benefits HQ2 may offer — the county has steadfastly refused to offer any details of its offer to Amazon, as the company has sworn HQ2 bidders to secrecy. There’s also no telling if the county and state might look to revise its incentive offer, now that Amazon has split up HQ2. County officials have long insisted that they’re prepared to meet these challenges, however, and with Apple still weighing its own move to Arlington, it seems quite likely that such conversations will dominate their attention in the coming months. Arlington County and the City of Alexandria trumpeted the selection in a joint press release issued shortly after Amazon’s announcement. 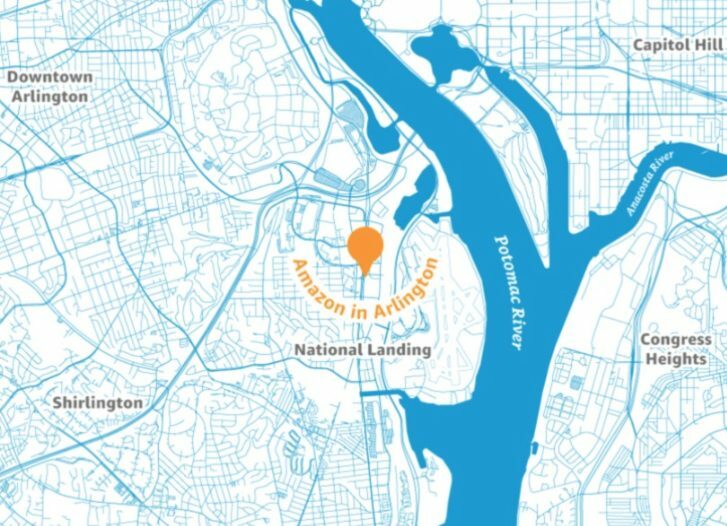 The press release says Virginia Tech will now establish an “Innovation Campus” in Alexandria near the new headquarters, while Arlington and Alexandria public schools will “have access to new resources related to computer science education, to be made available statewide” and George Mason University’s campus in Virginia Square will expand. Also funded thanks to Amazon’s arrival: the long hoped-for second entrance to the Crystal City Metro station and a new High Line-like pedestrian bridge from Crystal City to Reagan National Airport. Immediately following Tuesday morning’s announcement, local lawmakers started issuing statements on the selection. As a former Governor, now Senator, but also as a former technology executive, I’m really excited about the potential Amazon offers not only to Northern Virginia but the whole capital region and the entire Commonwealth. We’ve seen that major investments like these can bring not only thousands of direct jobs but also lead to job growth in other industries. As we welcome Amazon’s new investment in Virginia, we must commit to implementing this announcement in a way that will benefit the whole region and all of the Commonwealth. While serving as Governor of Virginia, Kaine focused on job training and education and by the end of his term leading publications ranked Virginia the best state to raise a child and the Best State for Business. Kaine has been a vocal advocate for Amazon bringing HQ2 to Virginia. Amazon’s announcement that it will bring half of its HQ2 to Arlington is a validation of a generation’s worth of work to make northern Virginia an economic engine of the nation. Congratulations to Governor Northam, and all my fellow Virginians, for winning a robust national competition. And congratulations to Amazon for selecting a very special community and region, ripe with diversity and promise.